WHEN NEURAL NETWORKS WERE publicized a few years ago, they sounded like the answer to all prayers. Want to predict lottery numbers, horse races, the financial markets? No problem! Just buy yourself a neural net program, input data, and figure out how to spend your 1,000 percent returns. Of course, most neural network pioneers did not have this perspective, but enough people were disappointed to create a backlash. Clearly, neural networks, which are programs modeled on brain research that essentially process data and, thus, “learn” to build progressively more accurate solutions to pre-defined problems, must be coupled with an experienced trader’s insight to yield the best results. “Experienced traders usually get much better results with neural nets than the neural net experts themselves,” says Ward. “That’s because they better understand which market indicators are more significant, and they also know when to override the neural net’s recommendations.” Technical traders, in particular, are often in a good position to work with neural networks because neural nets are “kissing cousins” to more traditional regression and statistical analysis techniques, which attempt to extract predictive equations from historical data. Over the past several years, there has been a great deal of progress in refining the technology and, in particular, in combining neural networks with other analytical tools for better results. For example, Market Technologies couples neural networks with traditional technical analysis. “Moving averages are very useful for eliminating market ‘noise’ and allowing traders to track trends,” says Louis Mendelsohn, the firm’s founder and a 20-year veteran of the predictive systems market. “The problem with moving averages, though, is that they lag behind the market.” Therefore, neural nets that predict moving averages rather than single prices can help traders identify instances where a market trend has changed direction. This methodology, explains Mendelsohn, can help traders look out about four days or so into the future. Currently, Market Technologies’ moving average forecast programs are accurate between 72 percent and75 percent of the time, and the firm’s goal is to bring that figure to approximately 80 percent by the year 2000. According to Ward, genetic algorithms, which also have roots in evolutionary research, are very popular right now, as are hybrid systems, which include elements from both genetic algorithms and neural networks. (Genetic algorithms work by starting out with a selection of random solutions to a problem. Over time, the best solutions are kept and “mated” to create new solutions with elements of both the “mother” and the “father” equations.) Another popular type of neural network is the polynomial net, which incorporates regression analysis. Because these nets actually produce regression-like formulae rather than simple directional predictions, explains Ward, traders are often more comfortable because they actually see what the network is doing and can better analyze its results. All of these methods can be applied to almost any market, although some markets may better lend themselves to neural networks than others. According to Ward, neural nets tend to work better in predicting the stock market, because, he explains, the stock market is simpler and subject to fewer market fluctuations than most futures markets. Mendelsohn’s outfit zeroes in on the major interest rate markets and also offers programs tailored to major equity and commodity markets. Neural networks’ ability to analyze relationships between the Treasury and Eurodollar markets can be particularly helpful to bond traders. Of course the sixty four thousand dollar question is: Who is making money with neural networks and related predictive models? According to Ward, there are a number of large corporations using neural networks to make predictions used in proprietary investment decisions. Similarly, a number of commodity producers use neural nets to help predict energy and other markets as an adjunct to their hedging programs. Advanced Investment Technologies (AIT), a money management firm with approximately $250 million in assets in Clearwater, Fla., has one of the longest track records using neural networks. According to K.K. Quah, AIT’s vice president for research and systems, the firm’s portfolio managers use both a neural network and a genetic algorithm to predict the behavior of individual stocks. AIT began using a neural network in September 1993 and then added the genetic algorithm in June 1995. Says Quah, “We look at the recommendations of both the neural net and the genetic algorithm as though they are two independent financial analysts, which can sometimes disagree. The results don’t dictate trading decisions, but they do help our managers focus their research.” For example, out of a big universe of stocks ‘including the S&P 500, the Russell 2000 and several other indices, the neural network and the genetic algorithm provide predictions that can substantially narrow that field. Of course, making money with these sophisticated technologies is an effort-intensive process that goes far beyond just installing some software. In fact, feeding your neural network the right data may be more critical than finding the single best model. Norman Smith, a California-based software engineer with Jurik Research Software, explains that many traders err in using neural networks by not fully understanding the importance of feeding the net quality data from which it can build solutions. Two critical issues that may not be immediately apparent to the new user include data redundancy and correct historical sampling. 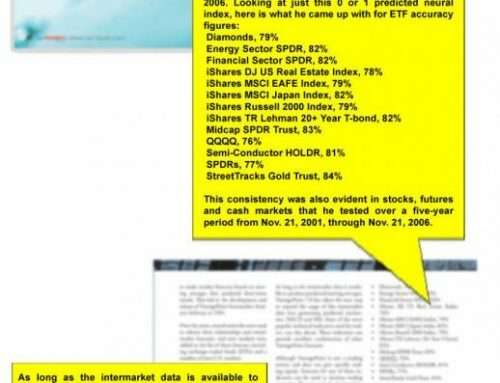 “In the first case, he says, “let’s say you have an enormous quantity of time series data and multiple market indicators. Not all of this data is equally valuable; in fact, much of it is redundant, reflecting the same market forces at work.” Likewise, traders who work with neural nets are often faced with reams of historical data that must be properly weighted and fed to the neural network. Says Smith, “It is important to find representative values for past points in time. Since it is possible that any single point in time you select could be anomalous, you need to create an average value centered around that point in history.” However, too much data can slow down processing while not enough data can compromise the quality of the solutions you receive. Will there ever be a perfect mousetrap? Not likely. Says Mendelsohn, “We have seen great improvements in the accuracy of neural networks over the years, but we will never see a program with 100 percent accuracy. A rate of 85 percent or so would be pushing the envelope.” So, for traders, the bottom line is clear. Neural networks are, now more than ever, a promising source of decision-making data, but they require diligent monitoring and they are no substitute for your own judgment.